South Park is an American animated sitcom created by Trey Parker and Matt Stone for the Comedy Central television network. Intended for mature audiences, the show has become famous for its crude language and dark, surreal humor that lampoons a wide range of topics. 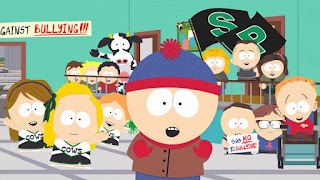 The ongoing narrative revolves around four boys—Stan Marsh, Kyle Broflovski, Eric Cartman and Kenny McCormick—and their bizarre adventures in and around the titular Colorado town. Parker and Stone, who met at college, developed the show from two animated shorts they created in 1992 and 1995. The latter became one of the first Internet viral videos, which ultimately led to its production as a series. South Park debuted in August 1997 with great success, consistently earning the highest ratings of any basic cable program. Subsequent ratings have varied but it remains one of Comedy Central's highest rated shows. It is Comedy Central's longest running program; a total of 226 episodes have aired, and the series is slated to run through at least 2016.